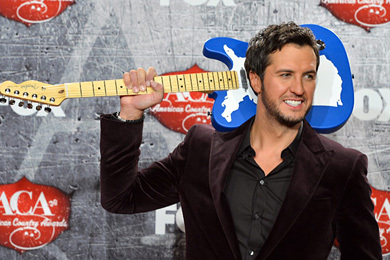 Luke Bryan was the biggest winner at the 2012 American Country Awards Winners, handed out Monday night (Dec. 10) at Las Vegas’ Mandalay Bay Events Center. The singer took home the fan-voted show’s top prize, Artist of the Year, and eight other trophies, more than any other artist. Bryan was followed by Miranda Lambert, who received three awards. Carrie Underwood earned two guitars, for a total of 11 ACA awards, the most of any artist. Lady Antebellum’s wins in Artist of the Year: Group, and Single of the Year: Group, plus their five previous awards, make them the group with the most ACA honors ever. The show aired live on Fox. Fans logged on to www.theacas.com to cast votes in support of their favorite country music artists.